Next week I'm going to be on a panel titled "Open Source Code: Managing the Opportunity". 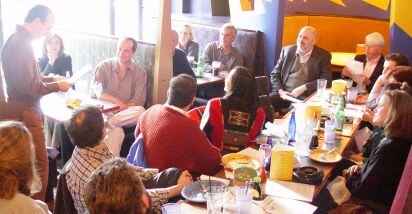 It is being organized by Goulston & Storrs, a law firm with a major office in Boston. They do lots of corporate financing work and are finding that questions about software assets are starting to come up frequently in venture funding, merger and acquisitions, and other due diligence situations. They felt it was time to do a seminar for their clients and other interested parties. Dan Bricklin, co-creator of VisiCalc and President of Software Garden, Inc. Learn how to manage open source code as part of a software development strategy. Prepare for and respond to due diligence and valuation inquiries by investors, lenders and acquirers. Puncture the myths about the "viral" nature of open source code. The panel is in Waltham, Massachusetts, next Thursday, December 16th in the early morning. People in the Boston area interested in attending should contact Matt Prinn at Goulston & Storrs (mprinn at their domain) by tomorrow. For all of you who can't make it but are interested, I've convinced them to record the event, and, if all goes well, Doug Kaye over at ITConversations has agreed to include it in his wonderful collection (I'll post here when that happens). 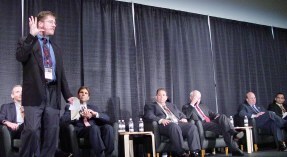 Steven Snyder, who is moderating and organizing this panel, is going to make it pretty interactive, without speeches. He's come up with a case of a hypothetical hardware-with-software company that addresses many of the issues in the real world. He based it on actual questions he had to deal with over the last three months. He has many questions for us panelists such as these: Mr. Investor, do the potential Open Source aspects of this company chill your enthusiasm? Should the company try to stop its use of Open Source or embrace it? How can it manage its software development processes in light of the inevitability that Open Source will be involved? Should it consider releasing some of its own software under an Open Source license? How will that affect valuation? How do you do due diligence here? This is different than the normal "Why Open Source will save you money" or "What is the GPL and why is it great/evil?" type of introductory talk. The audience includes some very serious, pragmatic people who are just waking up to this issue. I hope it goes well. In January of 1983 Jeff Tarter published the first issue of Softletter. Over the years he rose to become one of the most respected industry commentators, winning "Best Industry Analyst" twice in a row from the SPA and being repeatedly quoted in the press for all 20+ years. 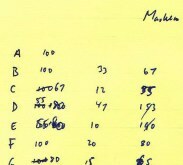 The publication, a subscription newsletter, provided very valuable information about the personal computer software industry and advice for software companies. A while back the publication got a new owner. I think this is a nice thing to do for people when you attend events. In addition to giving them a CD with all of the digital photos you took, include MP3s of speeches and maybe even interviews. Instead of needing to sit down for an hour in front of a TV to watch a video, they can relive all the "nice" things people said at a better time, like a podcast, and easily share it with friends (which is much harder with videos). I've done this for personal events over the past few months and this is the first time I did it for an industry thing. Personal podcasting. You don't even need a website or special equipment to start. A major part of podcasting is the fact it's audio and that we have ubiquitous portable sound players. I am pretty happy with my keynote last month for CRN on "innovation" in the computer industry. Putting it together resulted in me now having lots of material well organized for talks on that topic. As part of my ongoing work to develop a stream of income as a speaker, I'm now working on material for talks related to Open Source Software (OSS). As a programmer, executive in various software companies, Harvard MBA, participant in intellectual property lawsuits on various sides (including as an expert and target of suits), learning from the State of Massachusetts' efforts, etc., etc., I have a unique background. Some of that background is reflected in writings on this web site (such as the "Software That Lasts 200 Years" essay. In preparation for a panel I'm going to be on later this month on Open Source and the issues surrounding it with respect to corporate M&A, financing, and regulatory compliance (more about that at a later date), I attended a Mass Software Council presentation this morning titled "Open Source: Is it Entering the Mainstream?" My interest was in seeing what would be said to a more general audience than the lawyers and venture capitalists who will attend when I speak. The first of the invited speakers was Kirk Lasson, VP of Strategy for Novell, Inc. He, and others, talked about the "stack" of products/platforms, such as Linux for an OS, app and web servers, etc. He had a slide about how one big thing they bought when they acquired SuSe Linux was their tools for integrating OSS by going through lots of OSS packages, applying appropriate patches, and then building and testing it all for multiple hardware platforms (x86, Intel 64, AMD 64, POWER, S/390, zSeries). His last slide: "Eventually continuity becomes the most critical element in open source adoption...Is it about code or continuity of services...Motivation of incumbent vendors to sustain open source momentum..."
Kirk was followed by Doug Levin, CEO of Black Duck Software. Black Duck has a product for auditing source code to find open source components and then look for license conflicts. 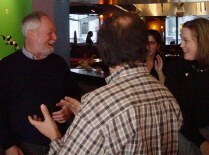 (I visited Doug at his office in Waltham, MA, last week to learn about their stuff as part of my learning in this area. His VP Karen Copenhaver, who is also an experienced IP lawyer, is going to be on the panel with me later this month.) Doug pointed out how in many categories of software OSS is the leading or "hot" product (web servers: Apache, server languages: PHP, SSH tools: OpenSSH, database: MySQL, browser: Mozilla/Firefox, application server: JBoss). He sees next year: More corporate projects that are done as OSS, less anxiety (vendors: more dual licenses, SCO suit settling in the next 2 years; large organizations: less license confusion, better educated support corporate IT, counsel & developers, new processes & automated tools). Next up was Andy Bang, directory of development at MySQL (he works in California). He gave examples of companies using OSS and lowering costs. He spoke about the LAMP stack (Linux, Apache, MySQL, Perl/PHP/Python). He talked about their product and company and gave examples of happy users. After the event, I spent time with him and a person from MySQL sales discussing their licenses so I'd have background about that, since their use of "dual licensing" (either free GPL or a normal proprietary for fee license: your choice) is an important issue in discussions about OSS, business models, and the need for careful reading in understanding licenses and their intent/meaning. The last speaker was Peter Quinn, CIO of the Commonwealth of Massachusetts. He talked about the need to change the way software development and procurement was done in the state government. I've covered much of what the state has done previously in this weblog and in the 200 Year essay. They are a leader in adopting policies on Open Standards and Open Source in government. He pointed us to a page on his web site that lists lots of material about legal issues. They are very knowledgeable in this area. Read the stuff they put up. Some comments I noted from his comments (not his slides): The old way of development led to software that was proprietary and had no one to support it (when the vendor quit the business). They need "the sustainability of COBOL". Japan does so much using SMS, which is very low bandwidth, while we are struggling to do things on PCs with great bandwidth. The state government just spent many, many millions of dollars putting in place Peoplesoft. If Oracle buys Peoplesoft and phases it out, you can see how entities like the state will think really hard about moving to OSS even if they have to get together to do it themselves. While the Massachusetts Attorney General may have been anti-Microsoft, the IT people definitely are not. They buy lots of Microsoft stuff. But when Microsoft patents use of XML in Office and only allows certain types of licensing for those patents and the government needs to have access to all they write and would like choice in their tools, that is a problem. That's all I have time to write up. I hope you found it interesting. My cousin Eyal in Israel, the farmer, just posted an account of last week's locust attack. I found it fascinating. 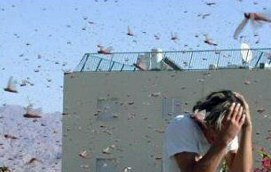 Locusts are a plague from way back (the 8th of the 10 plagues in the book of Exodus, for example) and sound ancient. Reading about them mixed with mentions of SMS messages and fighter planes is strange. Read "Locust Attack". You'll note from his other posts that this is a business blog. His readers are other farmers who grow flowers as well as some of his customers (flower stores). He grows flowers and sells them wholesale. A part of his business is selling them direct to the store and this website is part of that. Yesterday was the CRN (the publication that used to be known as Computer Reseller News) Industry Hall of Fame induction ceremony. This event has been going on since 1997 (I was inducted in 1998). It used to be held at Fall Comdex on Monday night but this year there is no Fall Comdex so they had to find another way to hold it. For the last few years it has been co-run with the Computer History Museum, so they did the logical thing and held the event at the Computer History Museum's building in Mountain View, California. In addition to the induction ceremony, they had meetings with various vendors (such as HP, Sun, Lexmark, Xerox, etc.) for their invited readers, mainly VARs. In the afternoon, they had two panels and a keynote. I was the afternoon keynote. CRN Editor in chief Mike Vizard's panel on "Making the Compliance Connection"
CMP Channel Group president Robert Faletra's panel called "2005 Road Map to Success"
I crafted a special talk for this event. They wanted time for lots of questions and answers, and the entire thing had to fit in a 45 minute time slot. That left me 25 minutes for a talk that would normally be more like 45. (The session started late, so the Q&A ended up being cut down to only about 10 minutes to keep things on time -- it was good that I had condensed my talk.) CRN Editor Heather Clancy, who originally invited me to do this keynote, introduced me. She related how I had shocked her years ago when I took her picture on stage before speaking (and later put it on my website, of course). That sort of forced me to do the same here, but I always like showing a "you are there, participant's eye view" of events. The title of the talk was "Innovation That Makes People Pull Out Their Wallets". I covered the difference between "invention" and "innovation", why people buy products, parts of the VisiCalc invention story, principles we learn from the success of the spreadsheet that help you figure out the answer to the talk's title, which technologies are getting hot now for innovation and why, and what they should do. The questions from the audience related to ease of use and adoption of technology. I was really pleased by the reception. People really liked the talk (at least many, many of them came up and told me that over the next few hours.) I usually asked what they liked (that's how I find out what to keep in my talks and what is OK to drop). Some parts (like invention vs. innovation and the comments about adoption of technology) were mentioned frequently, but many parts had at least one person who liked it. The Q&A was really important to them apparently, too. 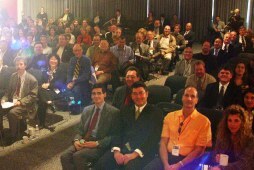 It addressed their concerns and people liked the way I related the real world to technology and their jobs. I guess Heather was right in leaving a good percentage of time for me to respond to questions. The people in the audience get real caught up in day to day stuff and don't get to see what they do in the perspective of a big picture of innovation and I gave them some of that. People like seeing photos from long ago. I showed pictures of me from the days when I developed VisiCalc as well as many of the classroom material I worked with at Harvard Business School that had an influence on the design of VisiCalc (they were all presented to help illustrate the point of how VisiCalc met a particular need and how I discovered that need). Most of the pictures were never-before-shown. In preparation (and as part of some help for an historian for a project of his) I pulled out some of the old boxes of classroom stuff I had in the basement and scanned in things I hadn't looked at in 25 years. In addition to the historic pictures, I had Powerpoint slides with a few points each or an illustration to help provide a visual backup to the principles I was discussing verbally. At one point, to show how personal computers were a breakthrough compared to the other computers of the day, I switched to my Tablet PC's Journal program which let me draw and erase smoothly with a pen. The drawings are something that I used to do on an overhead projector or blackboard, but that apparently works well in the new medium, too. I brought along a little wood brace I fashioned to keep my open Toshiba Portege Tablet PC screen rigid while writing (I need to run it with the keyboard open when giving a presentation for various reasons). The talk was videotaped and I hope to use it as a "demo" for people who are thinking of having me speak at their event. It's going to take some work to put that together. The induction ceremony was in the evening. 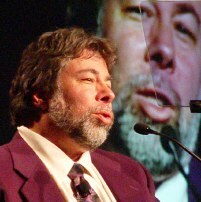 The keynote for the evening was given by Steve Wozniak. He gave a talk of nearly an hour (he was told to make it at least over 30 minutes long and he complied and there was no Q&A part). He covered his life in developing technical products from youth through the Apple II. It was fascinating to listen as an engineer. He's so driven to craft products that meet design criteria he sets for himself. He loves figuring out how to use minimal hardware to solve problems and has proven to be a real master of it. At the dinner table he told Heather Clancy and me how he put so many slots in the Apple II because he had figured out a really neat way to support eight of them even though Steve Jobs only requested a few. During the talk he explained the story of how the Apple II came to support color graphics on TV monitors with almost no additional hardware. Great stuff. The inductees were John Seely Brown, who was director of Xerox PARC, Jim Clark, of Silicon Graphics, Netscape, Shutterfly, and more, the late Edgar Codd and his partner Chris Date, for coming up with and evangelizing relational databases, Bob Huang, of Synnex, a very successful IT distribution firm, and Alvy Ray Smith, cofounder of Pixar and other things in computer graphics. The ceremony was interesting. CRN had some of its editors shown in a video going to a museum and finding famous paintings that made them think of an inductee. A curtain would open up, and there would be the inductee in costume acting out the painting "live". While they gave their acceptance speech, a painter painted an image of them in bold, bright strokes at the side of the stage and then hung it up. The speeches were very heartfelt. I'm always struck how the heads of large sales organizations (the distribution companies that also get the awards along with the techies) are so pleased and talk about their companies and the many people in them (often naming lots of names) like it was a mom-and-pop store under their house. 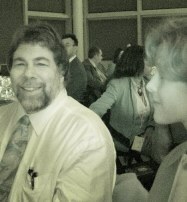 Woz's detailed talk about how he developed his products helped encourage similar detailed, personal accounts from the inductees. Clancy and Vizard in video choosing pictures to represent inductees, Bob Huang in "live" painting, and walking out of the "painting"
Even without Comdex, a great event.